Hewlett-Packard has built a reputation for quality bench multimeters every bit as impressive as Fluke has for the handheld variety. Nowadays they’re called Agilent, but this unit has the HP nameplate on it, and date codes on the parts inside suggest that it was manufactured in early 1987. The 3468A and it’s cousin the 3478A are 5½-digit 300,000-count multimeters. Both have instrument interfaces, the former with HP-IL (serial) and the latter with HP-IB (parallel, aka GPIB.) Basic 1-year DCV accuracy is 0.02% of reading + 2 counts for the 3V range. The 3478A has ever so slightly better accuracy figures and adds a 30mV range. This unit arrives in a completely non-functional state. It is dirty and dusty as are most of these old units, and probably hasn’t seen any use in some time. The remains of a Spanish-language calibration sticker on the back suggests it was maintained in a calibration program at some point in its lifetime. Looking inside, we find everything in very good condition. The entire analog section is shielded with a metal cover. Under that, there’s an impressive-looking hybrid, a 3V lithium battery to maintain the calibration data in memory, and a bunch of Coto small-signal relays. The analog-to-digital converter is a custom HP part in a ceramic package. The 12-character alpha-numeric LCD assembly has two COB-style drivers and is connected to the main board with a small ribbon cable. The keypad board is mounted to the main board with a small bracket holding an elastomeric connector strip. The microprocessor has an HP part number, but looking in the service manual reveals that it is an 8039, which is a RAM-only version of the 8048. A whopping 128 bytes of RAM. Firmware is contained in external ROM. This particular unit is sourced from National Semiconductor and has a 1986 date code. 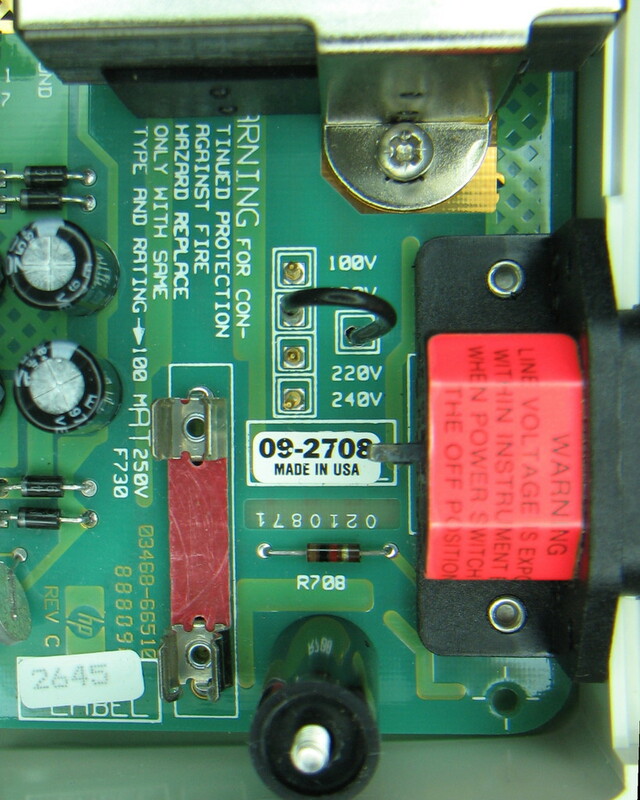 The transformer-isolated HP-IL interface is in the back alongside the power supply circuitry. The power transformer has four taps to easily change the mains input to different international voltage levels. Since the unit does not power up, first thing to check is the power supply. A small black mark on the element inside the glass mains fuse is a good clue that something has gone awry. A quick continuity check confirms that it is indeed blown. Small problem. The fuse is rated 100mA and I do not have an exact replacement handy. Obviously some unknown fault has caused the original fuse to blow, so substituting a higher value and then smoke testing it would be a dumb idea. Instead, I’ll use a variable auto-transformer (Variac) to slowly ramp up the input voltage while monitoring the current drawn. This will tell me if the fault condition still exists, or whether it was some transient that caused the fuse to blow originally. Starting at 0V on the Variac and ramping up slowly, I get to about 35V and the current is already measuring 100mA. The fault condition must still exist. Instead of studying the schematic like a proper engineer, I just go with probabilities and start checking diodes in the power supply section at the back. Sure enough, there is a group of six diodes surrounding four capacitors, and five of them measure as a dead short. That’s 0.0V on the diode-test range, both ways. It’s possible some other component or fault could be affecting the in-circuit diode test, so I remove a pair of the diodes and check them again. Now they test OK, out of circuit. I removed another pair and they test OK as well. Checking across the now-empty diode pads with an ohm-meter shows that the short (or shorts) still exist on the board somewhere. Next item in the probability-of-failure category: capacitors. The four caps in the middle are the likely suspects, so I just remove them all. And 3 out of 4 of them measure as dead shorts. All three are 0.2 ohms or less. This is an unusual failure mode for electrolytic capacitors in my experience, but the ohm-meter does not lie. All four capacitors get replaced. Another power-up attempt with the Variac shows only a 30 mA current draw for a full 120Vac input. That means I can stick in a 1/16A fuse that I have (62.5mA) and expect it to survive and still have protection in case something else goes wrong. The unit now powers up and passes the self-test, so hopefully there are no more faults. A quick check-out reveals that it is indeed functional on all ranges, and the calibration looks pretty good, except for AC current. (See note #2 below the calibration check table.) I would not use this meter for small-signal AC currents. In fact, experience has proved that AC or DC current measurements are not strong points for either the 3468A or 3478A. But this model does have other nifty features. One of them is 4-wire resistance measuring capability. Using separate source and sense test leads nullifies the test lead resistance, and allows for very accurate measurements below one ohm. The easiest way to perform a 4-wire measurement is by using Kelvin clips, as shown in the photo at right. The Calibration Value is the actual measured value by the makers of the DMMCheck with their equipment at the time it was calibrated. The DMMCheck reference signal is a square wave at 100Hz. 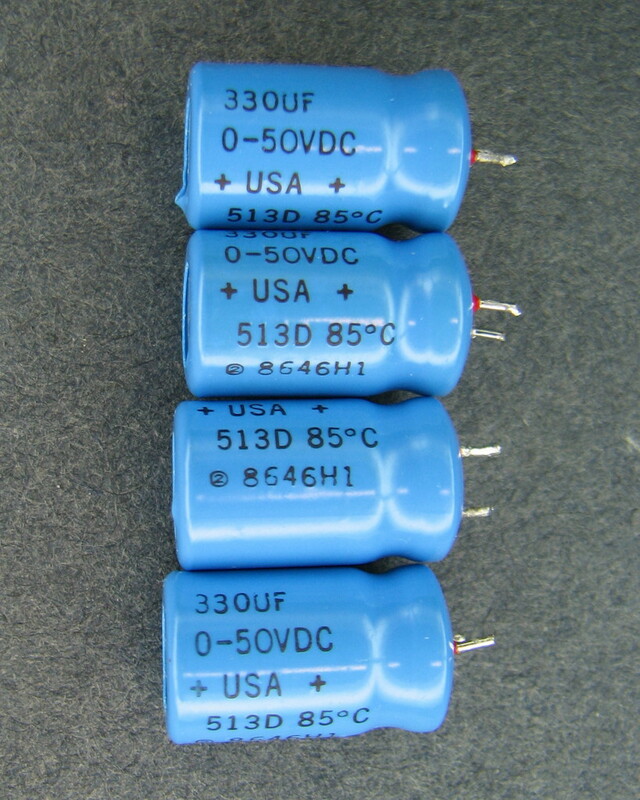 The lowest AC current range on the 3468A is 300mA. The most applicable accuracy specification is ±(1.1% of reading + 163 counts), which would mean that any reading between 0.826 and 1.174 is acceptable. In addition, the specification is guaranteed only for values above 10% of full-scale (30mA) and only for a sine wave. Neither restriction is satisfied in this case, so we’re lucky that it even reads this close! This entry was posted in Repair, Teardown and tagged DMM, HP/Agilent. Bookmark the permalink. I was going to do a teardown of the exact same meter in a few days becuase I saw no other person had. You must have been reading my mind. However thanks for the detailed photos! You’re welcome, glad you found it useful. Feel free to come back and add links to your work. If i was an envious person, i would be glowing bright green now lol. Personally i would still replace the diodes as they had to cope with a short circuit, i just dont trust stressed semiconductors, but thats me, im odd that way. Im supprised like you, the capacitors must have developed leakage but over time and lack of usage it became worse untill power was supplied and pop went the fuse. If more of that brand of capacitors were on the board they would soon end up in the bin of doooom, very quickly. Old hacker radios suffer with “incontinence capacitors” too lol. If you thought that was good, check out this youtube video. Great score and a clever repair to boot. I’m fairly sure the diodes are OK. Since they were shorted by the caps, no current should have been flowing through them at all. But the rest of the caps are automatically suspect. Next order of business though will be to replace the 3.0V lithium battery. Don’t want to lose the cal constants. Oh god yes, i had forgot it used software calibration. Wonder if there is a way to connect it to a serial link and save the ram to file, that would be nice, and copy the external rom contents as i bet thats impossible to find. just in case the rom fails. I bet there is dos software for that equipment. This undated datasheet I’ve been referring to shows a list price of $910 for this model. So I recieved mine today and found that someone else had already fixed the caps. And as well that the 2 lowest ranges are keeping the last measured voltage until I short the test leads. This occures event after switching to another range but this is not a huge problem for me. That behavior sounds normal. The 2 lowest ranges have an input impedance of over 10 Gigohms. The inputs can build up a charge just from noise, in addition to the last measured voltage. With such a high impedance, there’s just no way to dissipate the charge until you cross the leads, or connect to whatever you want to measure. What a pillock, he looks like he knows what he is doing untill he says “pots” for the top 3 ac compensation trimmer capacitors. I was screaming at the screen. I know my exact knowedge of multimeter is limited, but sticking a screwdriver into compensation capacitors is a no no unless you have exact setup instructions and the precision equipment to set it up. Why didnt he find the setup details and just point to the adjustments, oh brother what a moron. I only noticed your comment after i hit the enter key with a lump hammer lol. Sorry i had to express myself to someone that actually knows what he is doing. Yep i was pissed that a lot of people cant afford expensive test gear and that idiot was making a mess of a new device, i didnt even like the moaning about the fuses, correct tools and a brain are the answer to removal. That fluke 8050a was sold to me years ago by a frend that compared it to a cheap tandy bench meter lol, he wanted £20 or $30.4 us approx for it. It was an old lab multimeter, but calibrated by decent company. I realise the 8050a may be unimpressive but it was a dam site more accurate than i could ever afford at the time, and all the readings i took with it just seemed correct. The 8050A may not be flashy but it’s still a fine measuring instrument. I would trust mine more than most any new cheaply-made gadget, no matter how many digits it has. Exactly. I have one of these and it’s dedicated to 4-wire resistive measurements. The biggest fault with this unit, is the inability to “zero out” test lead offsets. It will give you a value, but you need to do the math yourself…..subtract the lead resistance. Not really a fault, just an inconvenience. neglected to mention…..a four wire (kelvin) hook-up…..lead resistance is not a big factor to be all that concerned about. A 2-lead resistive measurement is where this unit will need additional math……and that is what I was speaking of, above. Can I ask for advice ? Can’t say that I have enough experience with those particular issues to offer any real meaningful advice. DMMs generally have a very high CMRR, such that stray noise is not problem for DC measurements of relatively low-impedance sources. I do find that for resistance measurements over say about 500K, the shorter the leads are, the better. Great teardown pictures, I’ve just aquired one of these multimeters. I found two 3468A on ebay for an acceptable price (inclusive shipping and customs fees) that were offered “for parts”: One seemed to be dead, “…no power…”, and the other one still showed “Self Test OK”, but the AC functions are broken, they wrote. I own two HP3468A: One for about 30 years now. It’s still working and precise 🙂 , the other one I found in Larry Atherthon’s auction on ebay, recently. It’s refurbished and NIST calibrated. My old one has Battery Option, but in meantime without battery because in Switzerland I couldn’t find a replacement battery so far. So, equipped with schematics (service manual) and my two working 3468, I tried to find the problems. The other 3486 from ebay has Battery Option built in. But the ferrite core of the Transformator T901 is broken. It’s a hard-to-find PT 2318 type. This is because the PT 2318 isn’t recommended for new designs. I don’t know if there is a replacement available :(. The DMM itself powers up and shows “Self Test OK” normally. Well, sporadically and for a very short moment it shows “A – D error”. DC functions are working well, but AC functions didn’t show any reaction. VAC always showed -17.7…V . It didn’t take long time and I had strong suspect that the AD536A is broken. The output at jumper 302 showed -1.77 V, ten times less than the DMM reading. I tried to check correct function of the hybrid U102 – as good as possible – and I found it working well. So I removed the AD536. Pins 27/28 of the AD converter, or jumper 302, are showing few microvolts now, like a normal working 3468. Thanks for your kind words and detailed repair hints. Hi, I just obtained an HP-3468a a day or so back on eBay. It has the internal battery (which is dead, dead, dead…). I found there is a 2A fuse in series with the lead acid gel cell, so that being blown, the battery and its charger are effectively out of the circuit. The set appears to work fairly well despite the ‘Error 1’ that shows for a few seconds. Frankly, I did not notice the lithium cell at all when I had the set opened up, so I didn’t check its voltage. The Lead Acid gel cell HP used is still quite available, from several brands, at about $24. plus or minus from PowerSonic and several other brands, but because that is about what I paid for the meter (and another $25 for shipping it) I might skip getting a replacement. As long as that fuse is blown there is no consequence from the shorted battery, just no battery operation. Thinking about it, after reading the SM once, I find there is a 400 mA. Full Rate charge to about 7.1 volts on the gel cell, and a trickle charge of 130 ma. rate on that extra board, so maybe I can adapt some pairs of two parallel 18650 lithium cells, two pairs in series (7.4V), which could work well with that fairly sophisticated dual-rate charger giving an essentially minimal charge to the more modern lithium cells. Together, those would have a capacity of about 5A. vs. the gel cell’s rated 3.2A. (or 3.5A, for the newer gel cells). While the set would lose about 2+ lbs. of weight, it would gain 60% in battery capacity, allowing maybe 8 hours on a full charge. Maybe not now, but it could be something to play with. I also recently got a UK designed ‘Wavetek’ 2 MHz. Sweep/Function generator, with a nice 4 digit lcd readout, which also may be adaptable to putting in four of those Lithium cells, since it uses the 317, 337, and 7805 regulators, some of those high efficiency DC to DC boards that will up 7.4 volts to say 18 volts, might allow replacing the transformer and power supply with a +/- 18 volts to power the Sweep Generator for many hours off of 18650 cells too. I only wish the ancient HP-3468A unit allowed for the slightly larger more modern ‘shrouded’ test leads to be used, anyone thinking about how to implement that conversion, especially with that 3A fuse on the ‘Amp’ input jack?? ?